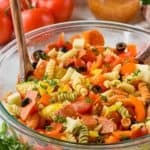 This Italian Pasta Salad is 20 minutes of prep and perfect for summer picnics, big backyard BBQs, and big family functions! Cook the pasta according to package instructions, rinsing with cold water when done. While the pasta is cooking, dice the peppers, slice the grape tomatoes, quarter the pepperoni, and cube the cheese. Mix together all of the ingredients except for the salad dressing. Add approximately 1 cup of the salad dressing to the pasta salad, reserving the rest on the side for guests to add to their portion if they would like more. Serve cold. See notes in the post for how to make this ahead of time. 1. Cook the noodles according to package instructions. Immediately drain them and rinse them with cold water after cooking. 2. When mixing this salad, only use about half of the dressing, leaving the rest on the side for guests to add to their serving if they wish.